An album as complete as Keep Pushing from Incognito frontman Tony Momrelle both exhilarates and frustrates. Exhilarates because it checks off every box a soul aficionado has with regard to what qualifies as a great album. Great melodies with memorable hooks? Check. Well-executed, soulful singing that you believe to be sincere? Double Check. Polished production, live instrumentation, and quality musicianship? Triple Check. A mature, fully developed concept album that uplifts while still having real, meaningful things to say about life and love? Quad Check. So, why does it frustrate? Because with the possible exception of the mild push by Reel People Music for the single “Pick Me Up,” there’s been very little rollout or publicity announcing the arrival of what is easily Tony Momrelle’s best solo project release in a very enviable catalog of great music spanning nearly two decades. It’s also easily and unequivocally one of the must own albums of 2015. Best known as “that dude who sounds like Stevie Wonder and Donny Hathaway” on a number of dance hits by Reel People and the UK’s acid jazzers, Incognito, Momrelle has been cutting sides since his Art & Soul Records days with such classics as 1997’s “Let Me Show You” and “If You Were Here Tonight.” With a collective 71 credits to his name as a singer, writer, arranger, and producer, Momrelle is not new to the game, operating largely as a working musician who is largely known by those paying attention to “featured” artist credits or who’ve recognized him as a background singer for Sade. There was some sense that with Reel People Music behind him on his 2013 commercial full-length R&B project, Fly, that he’d finally break through as a solo artist untethered to the Incognito or dance music brands that have been his daily bread. But, Fly was uneven and didn’t boast any bonafide critical or commercial hits that matched the performances on such DJ faves as “Star,” “Golden Lady,” “1 Step 2 Love,” and “Amazing feat. Imaani.” Yet, with a gifted talent of Momrelle’s undeniable caliber, a magnum opus just felt like a matter of time. Whether or not it’s his magnum opus remains to be seen, but it’s pretty close to perfect as a start to finish product in the classic R&B and soul traditions. Like Fly, there is a lightness of production feel to Momrelle’s material here, but the melodies and writing are stronger, everything feeling more essential, the messages even more timely. The instrumentation is accenting and respectful of Momrelle’s voice and stories as the main star; nothing here overpowers. Lyrically rich songs blossom in ways that are natural and fluid, especially on a diamond like “Lay It All Down.” The traditional songwriting on a lover’s groove like “All The Things You Are” feels effortless, one you’ll have on repeat for years to come. Like Wonder and Hathaway, Momrelle treats love and relationships with care, no one is disposable or disrespected, certainly not love, even in a love gone wrong. A timeless piano ballad like “Remember” appears as if out of a jazz or soul dream, immediately evoking the vulnerable surrender of church or a lonely piano player still singing his blues long after the club has closed. To say they don’t make them like “Remember” anymore is both a compliment and a lie, because here this brand new original song exists in 2015, doing everything we want a soul song to do. And, we’re grateful for it. No weepy balladeer that can only sing his pain, Momrelle demonstrates on the driving “Keep Pushing” that he’s equally persuasive at urging us from our blues into a healing sun with powerfully righteous encouragement. Reminiscent of early ‘70s message music, aided by a fiery Talib Kweli on the rapped bridge, and carried to its urgent conclusion by an equally burning horn section, “Keep Pushing” is one of hip hop soul’s finest. “Pick Me Up” matches the light bellbottom funk of “Keep Pushing,” but places the role of celebrated motivator in the hands of the ladylove who picks him up whenever he’s down. The foot-stomping, country soul of “This Could Be Us” is almost a “love is the answer” homage to cuts like “Wake Up Everybody” by Harold Melvin and the Blue Notes and “Love’s In Need of Love Today” by Wonder. The from-the-gut earnest optimism on “Keep Pushing” feels right on time in this age of hyper tribalism, fractured politics, and unbridled hate. A true believer, the minimalist “It’s Real” has Tony Momrelle exquisitely singing what it’s like after we got over, already at the Promised Land, conquerors already home. There’s so much love and hope in Keep Pushing, that you sometimes forget that this was the standard for R&B and soul just a generation ago. More than a socially conscious project, the musicianship on Keep Pushing is all top drawer and the producers without any obvious ego imprinted on speak-for-itself material that needs none. The musicians among you will especially appreciate the flawless and unexpected modulation that carries us into a bridge that almost begged to be its own song and then happens again just before the vamp out (y’all just showin’ off!). Guesting acoustic guitarist Tony Remy joins the list of musicians showing out on the Raul Midon flavored Latin jazz of “Different Street,” a cut whose dark storytelling starkly contrasts with its cotton soft delivery. When a flawlessly executed, but by-the-book cover of Donny Hathaway and Roberta Flack’s “Back Together Again,” this time featuring an adept Chantae Cann, is one of the least interesting tracks of the set, you know you’re doing something right. No one here is amateur and every composition and arrangement has its own unique shine. These eleven tracks illustrate why Tony Momrelle has always been an artist who music die-hards have tried to keep elevated in the public eye as one of the musicians to be reckoned with, and kept the faith that an entire album of beautiful creations existed within him. This love letter of a project proves that faith has been well served. It’s no wonder Momrelle was just nominated as one of SoulTracks Reader’s Choice Awards contenders for Best Male Artist of 2015. 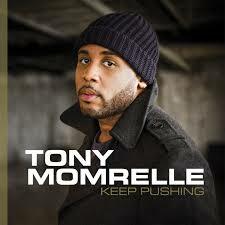 While it may be the most accomplished collection of Momrelle’s career, Keep Pushing is just the latest in a long line of timeless songs bearing his gifts. Hopefully, a lack of promotional push won’t prevent the world from now getting a chance to know them too. Maybe his fans can do something about that. Highly Recommended. Editor's Note: Reel People Music has also released an official video for "Back Together Again (feat. Chantae Cann)" and a lyric video for "Pick Me Up" in support of Momrelle's project.